Ninh Binh tourism week 2018 with the theme “Yellow Tam Coc – Trang An “ will be held at Tam Coc – Bich Dong, Trang An Scenic Area and some other localities in Ninh Ninh province from May 25 to May 31, 2018. The event is celebrated in the context of the 1050th anniversary of Dai Co Viet, the first Vietnam central feudal state, with the aim of introducing and promoting attractive features and outstanding values of Ninh Binh tourist attractions, especially Trang An Landscape Complex. The opening ceremony will be held at Tam Coc Boat Wharf on May 25. 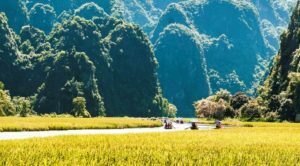 Visiting Ninh Binh during this tourism week, tourists will have great opportunities to experience many interesting activities in photo tours, photo exhibitions, walking streets, food festival and traditional music performance.